I’ll share a little secret with you. Maybe you’ve heard this one before. No one is truly an individual in this world, not really. The truth is, we are one big living, breathing entity sharing emotions, creativity, fear, joy, ideas, culture. We are all shaped by those around us, constantly growing into who we become, individual aspens connected by roots and sharing a dance of leaves in our branches, creating a beautiful forest that is ever changing. We rely on each other for support, we must learn from one another on how to move about this world, gain knowledge from each other through words, art and numbers, share critiques to be better artists, scientists, writers, and really, better humans. An aspen cannot stand on it’s own, it won’t wave it’s golden crown of leaves atop it’s branches alone. It must be connected to it’s sisters, mothers, daughters. Together, aspens thrive and share their beauty and strength together. March is Women’s Month and today we celebrate women across the globe. So what better time than now to share some of the most amazing and supportive women I have the pleasure of having in my life who make up my forest. Without these ladies, without my sister aspens, I would have given up on long ago on my dreams, would be at an emotional loss when times got tough, missed out on so many laughs and smiles. I am forever grateful to these beautiful women (and so so many more) for their integrity, encouragement, support, accountability and vulnerability. I found Cara through her beautiful and unique vintage floral watercolor art on Instagram. She was living my dream of being an accomplished stationer and artist so of course I wanted to know about her journey. I soon found that her beautiful pictures are often accompanied by powerful posts. She is vulnerable and honest about her business, about motherhood, about life and about art. And she cultivates a community of sisters who support each other in their art and lives. Cara is absolutely one the kindest and most caring people I know and always takes time out to listen to and connect with women in the community she cultivates. If you haven’t had the pleasure of meeting Cara , go introduce yourself on her Instagram page @rosaliegwenpaperie and read her amazing posts on motherhood, being a boss babe and importance of being surround by other supportive kweens. Not only is Gina an amazing creative, she is the most encouraging, honest and beautiful friend one could ever ask for. Gina and I met through a similar passion of art on Instagram and quickly became fierce friends. She is always encouraging with my art endeavors but always honest and helpful with critiques and suggestions, something I truly value and appreciate. 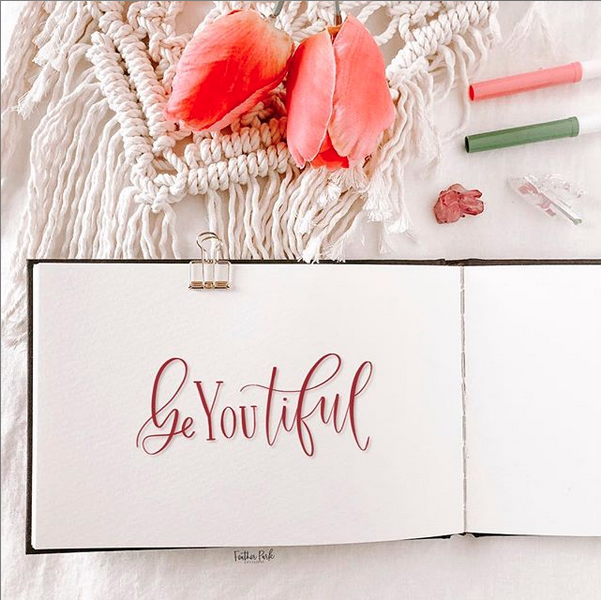 Her art journey has taken her from lovely watercolor art, to elegant calligraphy, to beautiful Ipad lettering, to turning her own calligraphy pens and creating her own flat lay boards and flat lay mock-up photos. She is always pushing her creativity to create unique and beautiful designs and pens and comes up with wonderful new products and art ideas. Not only is she an incredibly talented artistic boss bade, Gina is a wonderful listener and deeply supportive friend. She never hesitates to check in on me if I seem off or am sparse on Instagram and she even made a stop out my way on a family trip to hang out with me IRL. I’m so proud and thankful to have such an incredible sister. You can find Gina on Instagram @featherparklettering and see all her gorgeous work and give her a hello. Yeah, alright, of course mom is an important woman in your life who shapes who you are (be it positive or negative). But seriously, my mom is one of my closest friends and is such a rock in my life that I would be lost without everything she does for me. I’m fortunate to have such a close and positive relationship with my mom because I know so many women don’t get to have that. We act like sisters a lot and share everything. She is the least judgmental and wisest lady I know. She’s always lends an ear to my woes and joys, always has great advice, is incredibly encouraging and nurturing with my business aspirations and makes the BEST popped corn around (seriously, I don’t know how she does it differently, but it’s amazing). She’s also the hardest hustler I know and I’m really inspired by her ambition and fearlessness to move to the most expensive area in the world to start a yoga and art studio. I’ve learned so much from this woman over the last 34 years and I know I have so so much more to learn from her still. Thanks for being so supportive and such a fierce and empowering role model Mom! And I’m not big on my birthday. It’s not that I mind getting older. I guess because I always have too high of expectations for a perfect day. But I never really know what that perfect day is supposed to be. And damned if I’m always upset the day after my birthday for not taking advantage of having a whole day about me. Don’t get me wrong, I’ve never had a bad birthday, though my mum might say differently (yes, I cried at a lot of my parties as a kid). And, I don’t have many close friends around to celebrate with me. I’m a bit of a loner introvert at heart I suppose. I’m also really shy about attention. And you wouldn’t think I’m shy if you know me, but it’s true. I hate public praise or compliments about my work or myself, even though I secretly really need it. But I usually feel guilty or embarrassed when I’m positively acknowledge. Pretty terrible, huh? So even a “Happy Birthday!” makes me want to skitter back to the safety of my dogs at plants. This year, I’m once again feeling the birthday blues. Finances are tighter so we aren’t headed out to anywhere exciting or to do anything special. Aside from that, Bay Area blows for being able to travel anywhere in a reasonable amount of time anyways. Sorry SF, even a cheap day in the city isn’t worth the drive on weekday. Don’t fret about my birthday mopes though. My hubs always makes the day a bit more special for me somehow or another, my mum always spoils me with smiles and hugs and fun gifts and yummy treats. I also share my birthday with a very great man, something of which I’ve always been very proud. You might be thinking, “Why are you posting about your birthday if you can’t handle a ‘Happy Birthday!’?” I’m trying to turn over a new leaf, to be more outgoing and to be more accepting of compliments and to have a lot more confidence and self-love. It comes with the territory of having two businesses that force me to interact with a lot of people and share my creativity. I’m also trying to be more real and share more vulnerabilities. Because surely I’m not the only one who gets a bit blue on their birthday, right? I suppose I could have done a recap on 2018 sooner but, if you're like me, creativity and work doesn't stop to allow a break in time. But since we get a timeline, I definitely want to reflect a little on 2018. It was a big year with lots of emotions. Twenty eighteen was my first full year being self-employed, which came with many challenges and joys. I got to be home with my dogs (I'm really quite dependent on them), I had a flexible schedule to do yoga and walk my dogs, landed my first exclusive surface design contract, was able to pay off debt and pay a few bills, made six foot menu boards for a high-end wedding, had multiple wedding contracts, was an editor's pick on @etsy and shipped more wrapping paper than I thought I ever could and finally found my art voice. Along with all the good, there of course comes some not so great. The first half of the year was very difficult with still reeling from the loss of my mother in law and challenging with open another business (which paid off BTW). Life was chaotic, tiring, and busy. I lacked a lot of balance and focus for most of the year. And though my QuickBooks is showing a tiny profit at this point, I struggled with being able to fully contribute to my household on a regular basis which caused a lot of strife under my roof. I was able to keep my business running though, and for having been more focused full time for just a year, I think that’s pretty awesome. I really need to take some down time now and then. Unintentionally, I keep picking up YA novels because I get hooked on beautifully styled IG shots of moody and powerful covers and then binge buy a series...Costco and B&N make this entirely too easy around the holidays when I'm feeling spendy and more bookish so let's blame them. My first YA was the Red Queen series...great idea, terribly written and apaling editing. The Grisha Trilogy has, so far, been a saving grace to present a similar story that is well written (and obviously well edited). I already started this second installment and am a bit turned off by the naivety of the main heroine, but hey, she's supposed to be a late teen and I know I was hot headed and and naive when I was her age so I'll cut a bit of slack. I'm still full captivated by the imagery and writing and interested in what comes next every chapter. I'm not sure I'm looking forward to the end of this long novel (I read the last few paragraphs of most books...tsk tsk...but I'm a goldfish and often forget halfway through what I read) but I'm hoping to see some growth of Alina and rooting for the demise of the Darkling while enjoying the imagery and fantastic languages Leigh Bardugo injects into the story. I technically started reading this one too and then forgot I did until delving into Siege and Storm...I think I only got a bit into it so I'll just restart to refresh the bit I've already forgotten. This book was recommended to me by my mum and she had a copy so of course I accepted the loan. Plus, who doesn't like adorable martens? I've been lucky enough to see a little family in the wild and, whether or not there are actual martens in this story, I was hooked with the cute little mustelid on the cover. I've never read a Brian Doyle novel, but I've heard great things and I love nature themed novels so I'm hopeful to discover a new favorite author. My reason for spontaneously buying this book? The alluring, Victorian sounding title and a curiosity of why one Mrs. Hancock would be fraternizing with said mermaid. Yup, Cerise's reasoning on picking up a novel. It doesn't always work out in my favor. Here's to hoping this lives up to it's Goodreads reviews. Honestly, in my book spending spontaneity with Book of the Month, I added this on with The Mermaid and Mrs. Hancock because it was "free." I did read the summary and it does sound like a powerful story highlighting the strength of women in a misogynistic world. And I do love a good historical fiction novel. My grandma had this book next to her chair last I visited (was she trying to tell me something??) and she said she was really enjoying the read. My mum also said it to be good novel and had a copy (she's a library!) so yes, this is on my shelf begging to be read. I've been curious about Ove and this may help me decide whether or not to add that to the winter TBR. I also may or may not have been drawn in by the cover art. Being that I read the first and second installments of the Grisha series, I probably should read the third installment, right? Plus, I have Six of Crows and Crooked Kingdom waiting for my winter TBR. And since I accidently read the end of chapter 1 of this novel thinking it was the end end of the second novel and I have yet to goldfish it away, I'm intrigued, worried and I need to know what happens dammit. Everyone in my creative circle and their mum has read this (actually, don't quote me on their mums but my mum read it) so I figure I should give it a go. Seems to be a powerful and mayne introspective read. Plus, galaxy covers are pretty, 'nough said. The synopsis of this novel sounds fairly intriguing but in all reality, the title pulled me in instantly. Spoiler alert, I don't think there are any cute crawdad quartets involved in this story. I will admit that I am turned off by the comparison to Barbara Kingsolver (I couldn't finish Flight Behavior. The idea and imagery were fantastic but I'm really turned off by whiny and naive main characters like Dellarobia. Please recommend another Kingsolver novel to change my mind about her books.) Aside from that hitch, I expect that this will be an interesting and perhaps culturally insightful novel. And that is my autumn TBR folks. It's a little overwhelming like an eager to-do list of house cleaning that's been negleted for months, but I'll let it go through the end of November with the hopes that I cram a ton in over Thanksgiving break. I'm a binger, remeber? Have you read any of these books? Let me know if you did and whether you loved them, hated them, or?? I'm also taking suggestions for my Winter TBR, though my want to read list is already very, very long of course. Let connect on Goodreads, Instagram and email!